Sri. 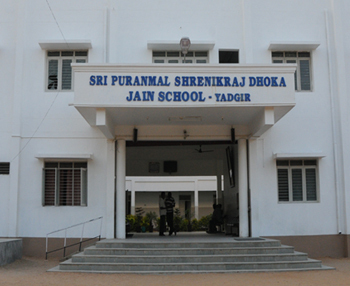 Puranmal Shrenikraj Dhoka Jain School situated at Balaji Nagar in Yadgiri is affiliated to Central Board of Secondary Education, New Delhi. The School is conducted and managed by Shri. Heeralal Dhoka Charitable Trust, Chennai under the chairmanship of Sri. Mahaveerchand Dhoka. The School has close proximity to Yadgiri Railway station and Central Bus stand. It is spread on 1.5 acres of land with approximate 25000 square feet of built-up area. Yadgiri is enjoying good transport connectivity to various parts of the country and it is connected to Chennai, Mumbai, Bangalore, Hyderabad and Kanyakumari through broad gauge Railway line. The National highway to Bangalore, Hyderabad, and Gulbarga passes through Yadgiri. There are good bus facilities to Bangalore, Hyderabad, Gulbarga, Raichur, Hubli and various other parts of Karnataka.